When many people think of Savannah, they think of Paula Deen. She started off delivering lunches, built a restaurant (The Lady & Sons) and now runs a veritable empire of cooking shows, products, and multiple restaurants. Paula put Southern cooking on the map, even though she took a lot of heat for pushing butter-laden and fried foods onto the already-obese American masses. Her recent admission to having diabetes brought on another onslaught of criticism. But throughout it all, she's remained the picture of a Southern lady, with her charming accent and blinding smile. 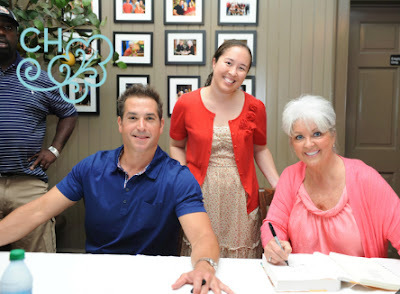 Paula and her son Bobby recently did a book signing at The Lady & Sons, so I headed to Savannah to meet and greet the pair and get my Paula Deen's Southern Cooking Bible autographed. Since they limit the signing to 350 people, I showed up early to get in line. I wore a cute dress and cardigan, but then the weather happened. As we were standing outside in line, a torrential downpour started coming down. Even though a couple of tourists let me huddle under the edge of their umbrella, I got completely drenched. Drenched like I jumped in a pool. I shivered for two hours as I waited to meet Paula and Bobby... and then it was my turn! They were smiling and super nice, and Paula looked GREAT. She looks like she's lost a few pounds, but she is positively glowing. You can tell that the person she is on television is the same person she is 100% of the time. It was a fleeting moment when I got to meet them, but I am glad I did. After all, how could I leave Savannah without meeting the woman who helped put it on the map? She's done some amazing things for the city, and I'm glad I got to see her in person.